‘We are delighted to launch a brand-new monthly night of much-loved and rarely screened gems, presented by Heavenly Films. The opening programme celebrates the tenth anniversary of Paul Kelly and Kieran Evans’ FINISTERRE, which premiered at the onedotzero festival in April 2003. 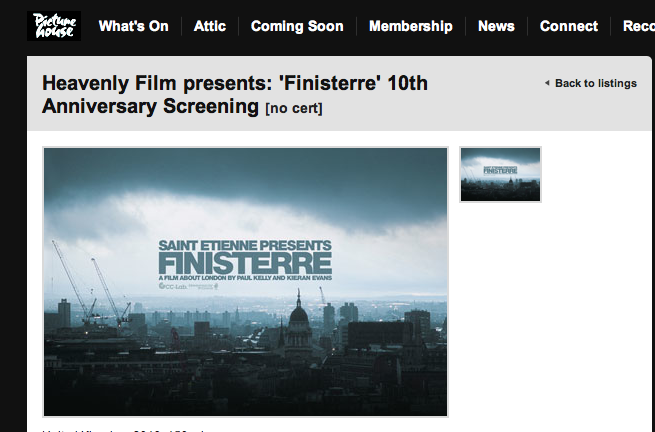 Conceived with and scored by Saint Etienne, this hour-long documentary about a day in the life of London has gone on to become a cult classic, but is rarely screened in the city it chronicles.